Listening to Paul Howard flapping his lips while I, literally, had my mince pies on Sorcha checking me out, the whole time. Or at least I would have if I was Ross O’Carroll Kelly. Paul Howard and members of the cast (Rory Nolan, Sarah Greene, Gary Cooke) of Between Foxrock and a Hard Place were in town promoting the play, which is set to take the Cork Opera House by storm on 28th of March; produced by Landmark Productions. This is the second instalment of RO’CK plays, and is going to be quite different to its predecessor, The Last Days of the Celtic Tiger. I had the privilege of sitting down and talking with the gang. For people unfamiliar with Ross, he is a suburban, wealthy middle-class rugger bugger, who has bedded almost every woman in Dublin under the age of 40, and a few over. He also claims he has one up on Brian O’Driscoll, because Brian never won a Senior Cup medal in school. Ross was created by Paul Howard when Ireland was in the boom period of the Celtic Tiger. Now, of course, things are quite different, and the theme in Between Foxrock and a Hard Place reflects this. The audience will see the O’Carroll Kelly family falling apart in the midst of an economic breakdown. According to Paul, the first play was experimental, in that it was his vision of a sitcom on stage. However, the new play will have a more orthodox structure, with two acts and four scenes; all of which are set in the O’Carroll Kelly Drawing room, with all of the main characters present. This was always a wish of Paul’s: to have each of the main characters together in one room, and experience the tension, which has been building for years, finally explode. When asked why he decided to transform Ross into a stage production, Paul said he “balked at the idea originally”. But when Anne Clarke from Landmark Productions introduced him to Jimmy Faye, who was to be the director, he began to come around to the idea. Furthermore, he met Rory Nolan (Ross), who belted out a few Ross classics. At this point Paul had really become relaxed with the idea, mainly because he never envisaged he would ever see Ross in real life, and yet, here he was standing in front of him in Rory; who Paul claims is “full of himself”, just like his character. So the stage was set and Ross and the gang came to life in The Last Days of the Celtic Tiger. The story of how Ross came to exist is well known. Paul, while covering the Leinster schools rugby, overheard a boy saying to his dad: “I don’t give a fock how you think I played- just crack open the wallet”. But, what isn’t so well known is that Paul thinks Ross is actually a mild mannered version of these schoolboys. One particular story Paul mentioned concerned a friend of his who was riding the DART (or the Dorsh). On this particular journey, the train was absolutely packed, but the end carriage seemed a little emptier, with Castlerock schoolboys within. Whenever someone tried to enter, a “bouncer” at the door stated: “Sorry- this is a rock carriage”. This shows the typical over confidence which was given to the kittens of the Celtic Tiger. Although these characters are whom Paul satirises, he believes that they are also Ross’ biggest fans. When asked if he thought he had created a monster, Paul chortled: “I hope not! I like to think I’m the reflector, not the director”. As Rory Nolan sat down next to me, in all the Ross O’Carroll Kelly clobber (Leinster shirt included unfortunately), I found it difficult to keep a straight face. Having read all the books, it is safe to say that Rory is perfect for the part of Ross. Strong jawed and quick witted, it is difficult to imagine another actor portraying the part. Rory began acting at an early age. However, after a pause during his teens, it was when he attended UCD his acting truly became a passion. It was here he joined the university Drama Society, which gave him a sample of all aspects of theatre, including: acting, camera work, lighting, and producing. Rory suggests for anyone interested in acting to get involved with their college Dramat Society. After UCD, Rory became a professional subsequent to graduating from the Gaiety School of Acting. Not only does Rory have ample acting experience, his life experience is quite suited to playing Ross also. Playing wing-forward for his school in his teens, he, on many occasions, got trampled on by D4 Ross-a-likes. Of course he had to get in a punch about Leinster having the upper hand on Munster of late; but, the mention of two Heineken Cups soon quietened his cough. One of Rory’s favourite Ross moments is when Ross is walking past a security guard who is picking his nose, and Ross says to him: “hey, did you pick a winner”. Sorcha, who is, arguably, the love of Ross’s life, is described in the books as: petite, and beautiful, with curly blonde hair (and usually wearing Issey Miyake). Sarah Greene, donning a curly blonde wig fits the part perfectly (although I’m not sure whether she was wearing Issey Miyake or not). Being from Cork, Sarah lacks a natural D4 accent, but assures she is well accustomed to performing Dublin accents. This is Sarah’s first time joining the cast in a Ross play. She is replacing Lisa Lambe who previously played Sorcha. Like Rory, Sarah began her acting career at a young age. She performed in pantomimes, and joined the CADA Performing Arts Academy. This was when she decided acting was to be her life. Since graduating from the Gaiety School of Acting she has been working professionally. Even though the stage is Sarah’s true passion, she has had some success on camera also. The Guard is an Irish movie by the same creators of In Bruges, which premiered at the Sundance Film Festival. Sony were extremely impressed with it and bought the rights to it. It is set to release in Ireland over the coming summer. Sarah says that although she would never turn down acting for the camera, there is much greater rewards to be gained from stage performance. When asked if she preferred acting in dramas or comedies, Sarah said it is “too tough to decide”. Acting in a comedy will always provide a buzz, but acting in a drama can create very powerful emotions which can be felt between actors and the audience. On some occasions Sarah has been approached by audience members who could relate directly to her character. These emotions, she says, cannot be felt while performing to a camera. Gary Cooke (I, Keano, Après Match) was the last, but not least, to join me. Gary started acting while at university. His debut performance was in Footloose, and he became professional in 1988. Even though Gary has appeared in many stage performances, his performing preference is on camera. He claims that the camera lacks the nervous energy of the stage, which suits his personality better. Gary’s character in Between Foxrock and a Hard Place is a gunman who attempts a tiger kidnapping on the O’ Carroll Kelly family. Gary states his character is “a guy with post traumatic stress, and doing this brings it all back to him from the Lebanon”. After this spell of acting, Gary is hoping to concentrate on his own stand-up comedy material, and return to Après Match later in the year or next year. Unfortunately for the cast, on Patrick’s Day they will all be rehearsing, so celebrations will be kept to a minimum. In true Ross O’ Carroll Kelly style, Rory added that he will give his four month old its first taste of Guinness. 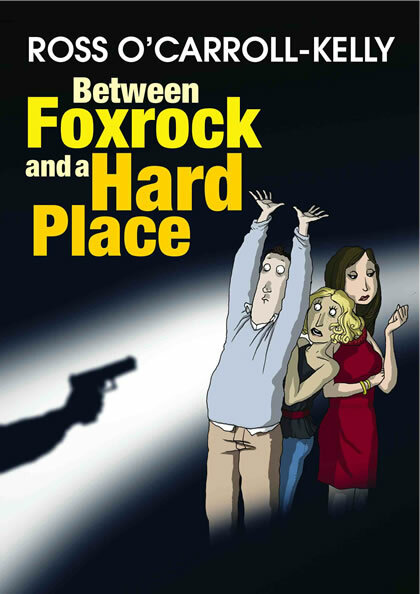 If you are a Ross O’Carroll Kelly fan, and have read the books, then check out the Cork Opera House between 28th March and 2nd April, to see Between Foxrock and a Hard Place. Even if you have never heard of Ross, it is guaranteed to be a good night out. Paul Howard’s satirical view of a generation the Celtic Tiger created is not to be missed. So get your ‘rents to crack open their wallets, tell the old dear to iron the chinos, dust off the dubes, slam a few vitamin h, high five Oisinn, and hit the Cork Opera House.